Magritte was born in Lessines, in the province of Hainaut, in 1898, the eldest son of Léopold Magritte, a tailor, and Adeline, a milliner. He began lessons in drawing in 1910. In 1912, his mother committed suicide by drowning herself in the River Sambre. Magritte was present when her body was retrieved from the water. The image of his mother floating, her dress obscuring her face, may have influenced a 1927–1928 series of paintings of people with cloth obscuring their faces, including Les Amants, but Magritte disliked this explanation. He studied at the Académie Royale des Beaux-Arts in Brussels for two years until 1918. In 1922 he married Georgette Berger, whom he had met in 1913. Magritte worked as an assistant designer in a wallpaper factory, and was a poster and advertisement designer until 1926, when a contract with Galerie la Centaure in Brussels made it possible for him to paint full-time. In 1926, Magritte produced his first surreal painting, The Lost Jockey (Le jockey perdu), and held his first exhibition in Brussels in 1927. Critics heaped abuse on the exhibition. Depressed by the failure, he moved to Paris where he became friends with André Breton, and became involved in the surrealist group. When Galerie la Centaure closed and the contract income ended, he returned to Brussels and worked in advertising. Then, with his brother, he formed an agency, which earned him a living wage. Surrealist patron Edward James allowed Magritte, in the early stages of his career, to stay rent free in his London home and paint. James is featured in two of Magritte's pieces, Le Principe du Plaisir (The Pleasure Principle) and La Reproduction Interdite. During the German occupation of Belgium in World War II he remained in Brussels, which led to a break with Breton. At the time he renounced the violence and pessimism of his earlier work, though he returned to the themes later. 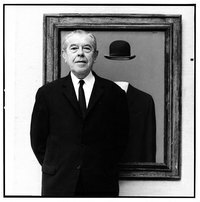 Magritte died of pancreatic cancer on August 15, 1967 and was interred in Schaarbeek Cemetery, Brussels. Popular interest in Magritte's work rose considerably in the 1960s, and his imagery has influenced pop, minimalist and conceptual art. In 2005 he came 9th in the Walloon version of De Grootste Belg (The Greatest Belgian); in the Flemish version he was 18th.